The stock jumps came for one simple reason. 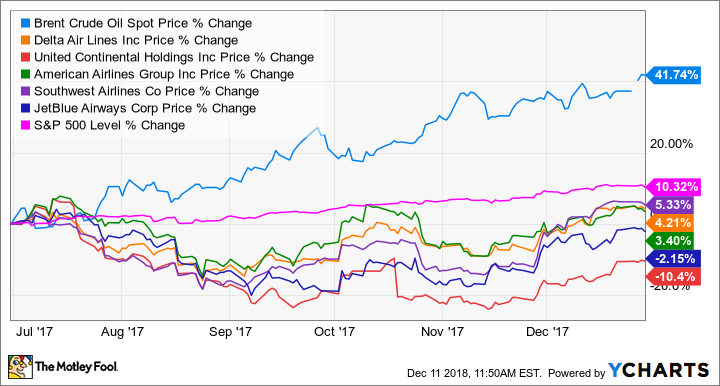 November was fantastic across the board for airline stocks, which popped more than 10% -- and in one case, by more than 20% -- for the month, according to data provided by S&P Global Market Intelligence. This was true for legacy carriers like Delta Air Lines (NYSE:DAL), United Continental Holdings (NASDAQ:UAL), and American Airlines Group (NASDAQ:AAL), which rose 10.9%, 13.1%, and 14.5%, respectively. But the rally was even more pronounced for smaller discount carriers. Shares of JetBlue Airways (NASDAQ:JBLU) soared 16.7%, Allegiant Travel (NASDAQ:ALGT) was up 17.8%, and Spirit Airlines (NYSE:SAVE) was the best performer, with shares rising 23.5%. Somewhat surprisingly, the granddaddy of discount carriers, Southwest Airlines (NYSE:LUV), only had a stock gain 11.2% for the month. Even regional carriers like Hawaiian Holdings (NASDAQ:HA) saw benefits. Hawaiian's stock rose a solid 16%, while Alaska Air Group (NYSE:ALK), which also operates Virgin America, climbed 19.3%. Even foreign carriers like Panamanian Copa Holdings (NYSE:CPA) and Deutsche Lufthansa were up, by 17.4% and 22%, respectively. Airline industry stocks outperformed in November, thanks to lower oil prices. Image source: Getty Images. What caused this impressive industrywide jump? Two words: oil prices. Fuel is one of the largest expenses for airlines, behind only labor. However, labor is usually a fixed cost in the short term, which means that fluctuations in fuel prices probably have the single biggest impact on an airline's bottom line in the short term. Because the cost of jet fuel corresponds tightly to oil prices, movements in the price of crude oil affect how much airlines pay for their fuel. So when oil prices go up, airline stocks feel the pinch. On the other hand, when oil prices drop, airlines can make hay while the sun shines and usually see their share prices increase. As you can see, all of them rose by double digits, handily outperforming the S&P 500's 4.3% increase. United Continental and Southwest even saw better-than-50% gains! Of course, the opposite is also true: When oil prices climb, as they did in the second half of 2017, airline stocks tend to underperform the broader market. 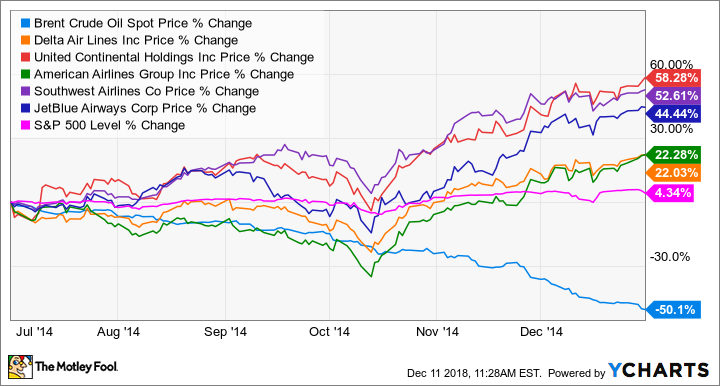 All of the airline stocks underperformed the broader market during this time period, and United Continental and JetBlue shares even lost value. But while all of this is informative to airline investors, it doesn't really say much about how to proceed. Of course, oil prices aren't the only things that affect the aviation industry. Broader economic indicators can also have a big impact, because when the economy is strong, people and businesses tend to be able to afford more flights. Competition is a major factor as well, especially when a low-cost airline decides to expand into a new market, which tends to lower fares across the board in that market (a phenomenon dubbed "The Southwest Effect" when Southwest is the low-cost carrier in question). Earlier this month, though, a completely different event may have sent airline stocks lower, despite lower oil prices: an analyst downgrade of the entire industry. Hunter Keay of Wolfe Research posited that low oil prices encourage poor management decisions, like lowering fares too much or adding overly excessive capacity. However, as my Fool.com colleague Adam Levine-Weinberg demonstrates in this excellent article, the tailwinds they get from lower fuel prices should outweigh any headwinds from excess capacity. On top of that, OPEC and Russia recently announced a 1.2 million-barrel-per-day production cut, which caused oil prices to rise (and airline stocks to fall). However, the bump was short-lived, as news emerged that the plan has no country-specific quotas and that Iran may have received an exemption. Questions about how the U.S. relationship with Saudi Arabia might impact oil prices have also raised concerns. So while it seems that lower fuel prices may be likely to stick around through the end of the year after all, it's important for investors to realize that this isn't a slam dunk. However, it does mean that now is probably a good time to keep airline stocks on your radar, because if oil prices continue to fall -- or even stabilize at current levels -- the entire industry is ripe for big gains.